The Ridebook is an exploration of Harley-Davidson – its heritage, culture and lifestyle – through the eyes of a new generation of writers, photographers and filmmakers. Six weekly installments combined to create a multimedia online destination, with built-in social sharing and modular distribution. 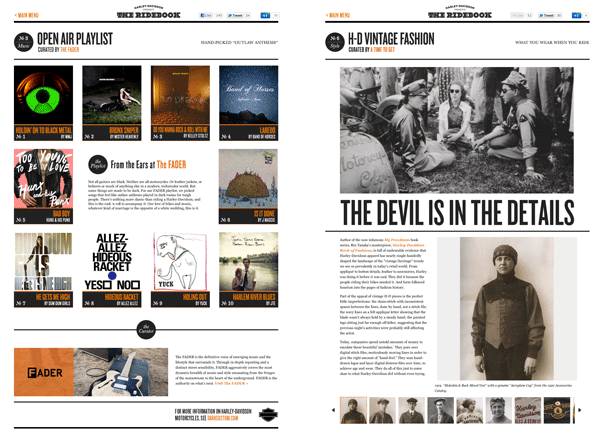 To produce each module, we partnered with a small cadré of content creators carefully selected for their voice, vision and fan base, including UrbanDaddy, The Selvedge Yard and The Fader. Each was given an editorial brief and then asked to express their passion for Harley-Davidson in their own unique way. In this short, Oscar Zabala of Relic (who also provided overall art direction) explores Tomcats Barbershop in Brooklyn, where classic haircuts meet the classic American bike. Designed to evoke the feel of a contemporary, upscale magazine, The Ridebook’s multimedia transitions were created using HTML5, to enable a PC- and tablet-friendly environment. As well as being collected on The Ridebook site, each was also embedded and shared by curators to their own fans and followers, on their blogs and social media venues. Here, Scott Toepfer, director of It’s Better In The Wind – a photographic and filmed exploration of bikes and the open road – takes a trip to Bodie, CA, one of the last American ghost towns. Facebook-connected comments on each story provoked lively community discussion. Some content was widely embraced, whereas other pieces engendered diverse opinions, split between long-time riders and a new generation of Harley fans. And, given our brief, that was kind of the point. 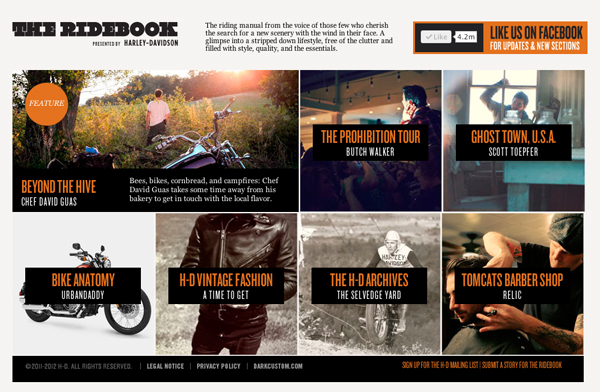 "Harley-Davidson presents The Ridebook" can be experienced here.